A suite of samples was collected from the Tanco pegmatite mine during an organised visit. A large number of these samples were collected from surface waste dumps and their actual location and geological context are not known precisely. Other samples were collected from the underground mine workings, still active at the time of the visit. These samples have location and geological context information. 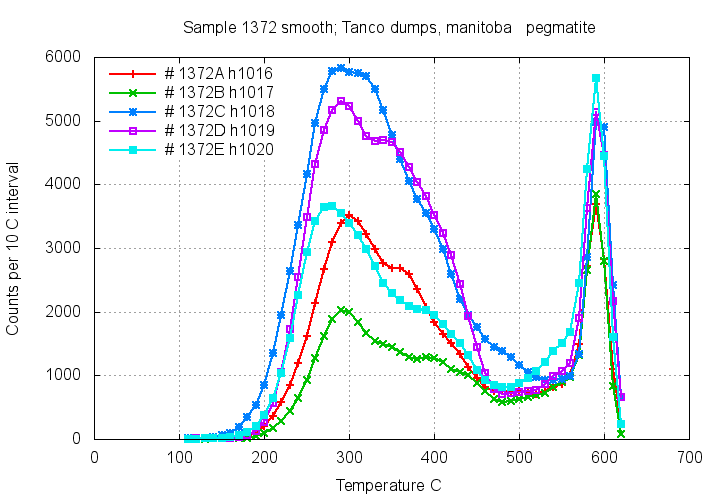 Samples from the Tanco pegmatite show remarkably high decrepitation at very low temperatures (200 to 300C) indicating the presence of very high gas contents (CO2 + CH4) in the fluid inclusions. 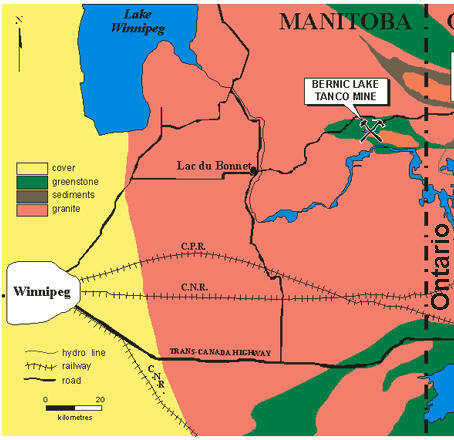 Although CH4 has been found in inclusions at Tanco by R. Thomas, his samples were from near-wall locations and the CH4 may have originated from the surrounding country rock. 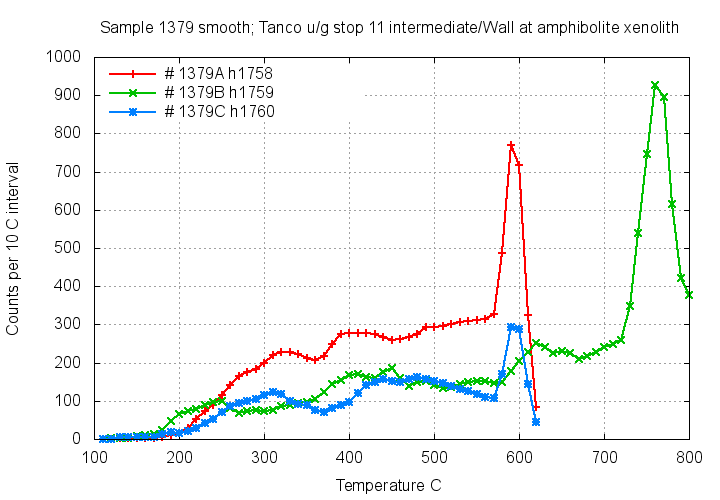 The decrepitation data shows that the highest gas contents occur in or near the core zone of the pegmatites, where CH4 is probably minimal and it is therefore concluded that CO2 is a prominent constituent of the primary Tanco pegmatite formation fluids. 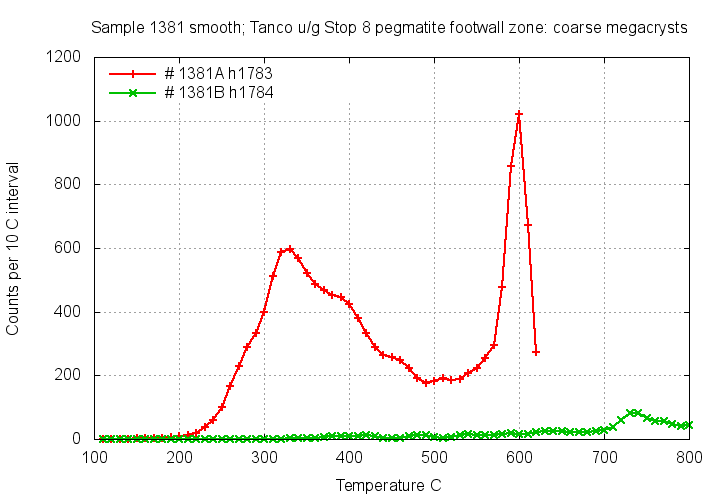 Such CO2 rich fluids do occur in other pegmatites documented here, but to a much lesser extent than at Tanco. 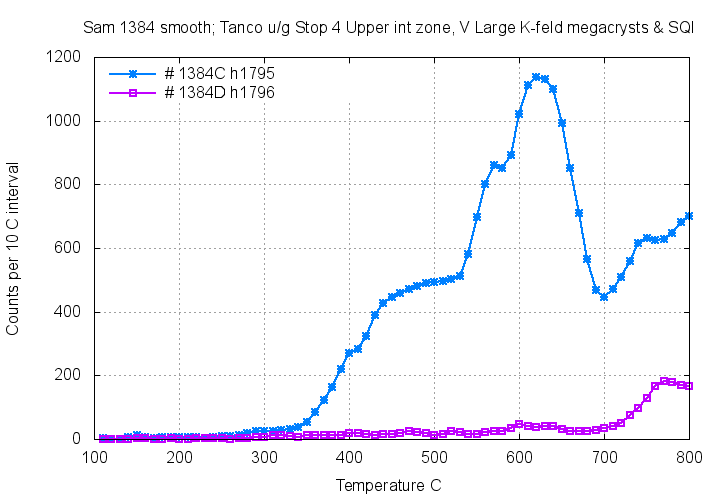 Although there are interesting variations in decrepitation between 350 and 550 C, it is not possible to interpret the origin or significance of these changes based on this data. Feldspar samples can show decrepitation, such as sample 1374D, but most feldspar samples analysed in this study show very little or no decrepitation which does not match the decrepitation from co-existing quartz samples. It is unclear why feldspar samples lack fluid inclusions or have trapped such different inclusion populations to the adjacent quartz, when both minerals presumably formed from the same fluid. 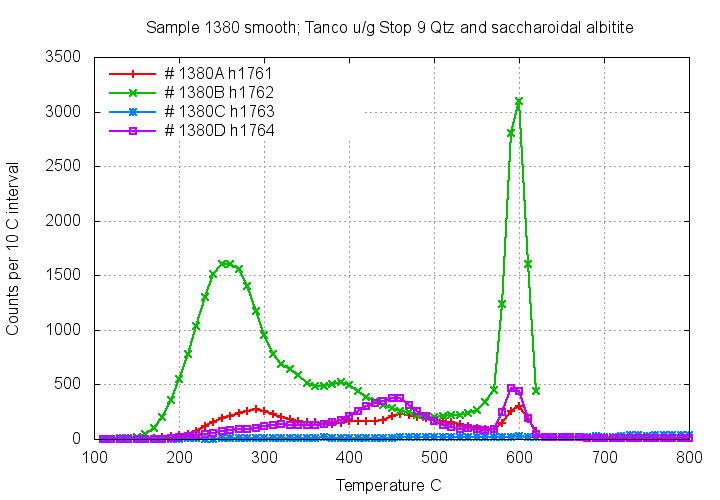 Pollucite (sample 1385H) did show intense decrepitation, though it lacked CO2 rich fluids. Insufficient monomineralic pollucite samples were available to interpret this result. Pegmatites, and specifically the quartz within them, are suitable materials for acoustic decrepitation analysis, and such decrepitation analyses may aid in exploration for economically valuable pegmatites. Samples 1372 to 1375 were collected from waste dumps on the surface near the mill. Quartz samples from Tanco usually show intense decrepitation at low temperatures between 200 and 300 C indicating the presence of abundant gas rich inclusions with high gas partial pressures. Work by Rainer Thomas has shown that CH4 is common in fluid inclusion fluids at Tanco and decrepitation can only show the combined effect of ( CO2 + CH4 ) contents. 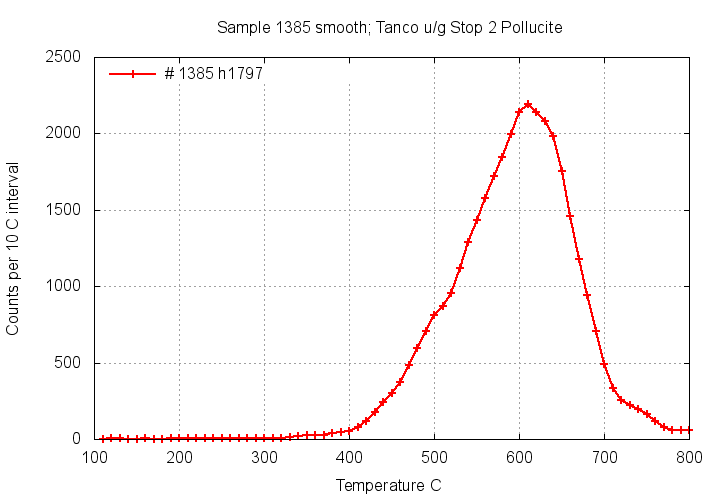 However it seems that the gas content in the fluids at Tanco is far higher than the estimates of 1-3 mol % (combined) reported in the literature. 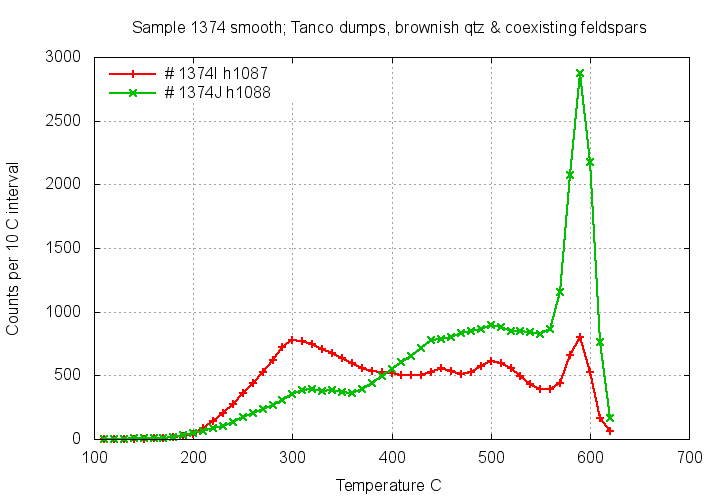 Feldspar (1374K and 1374L) coexisting with quartz (1374i and 1374j) is shown in two plots below. 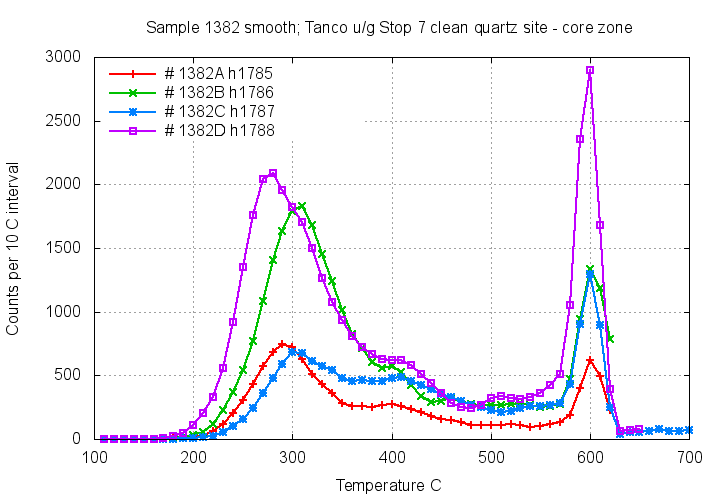 The temperatures, such as the small peak at 450 C, do not correlate with features in the quartz decrepitation plots. The feldspar and quartz either formed from different fluids or feldspar and quartz are selectively trapping different components of the same fluid. Quartz coexisting with the above feldspar. 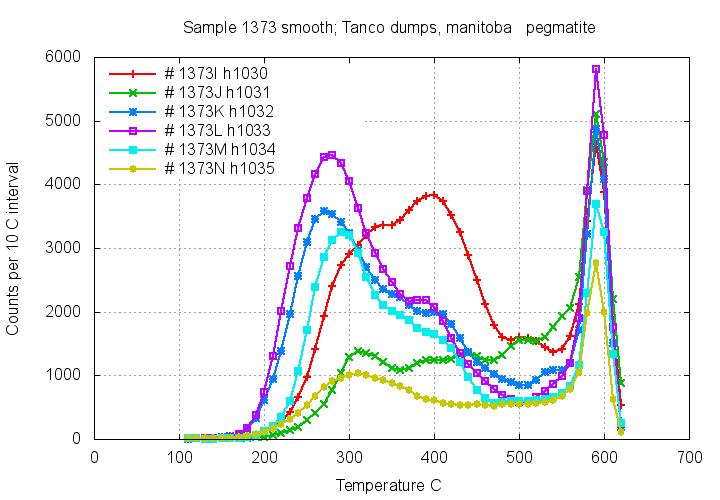 The low temperature 300 C peaks do not have matching peaks in the coexisting feldspar samples. Samples 1379 to 1386 were collected from within the active underground mine. The feldspar (sample 1379B, green) shows similar decrepitation to the coexisting quartz. But CO2 content is low in this intermediate zone. 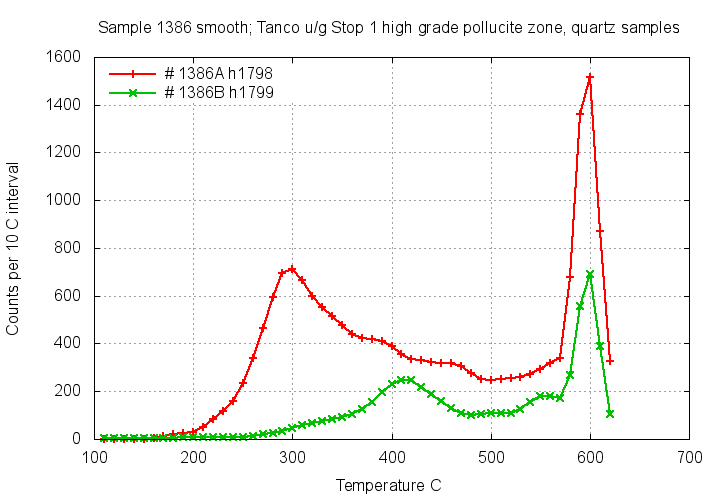 Quartz in samples 1380A and 1380B shows very variable CO2 content over short distances. 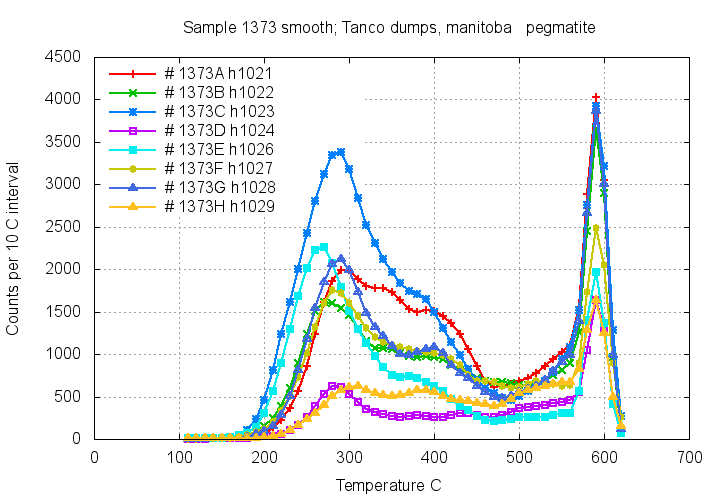 Sample 1380C (blue) is of albitite and has no decrepitation at all. Sample 1380D (magenta) is mixed quartz and albitite, showing low decrepitation because of dilution with the "inert" albitite. 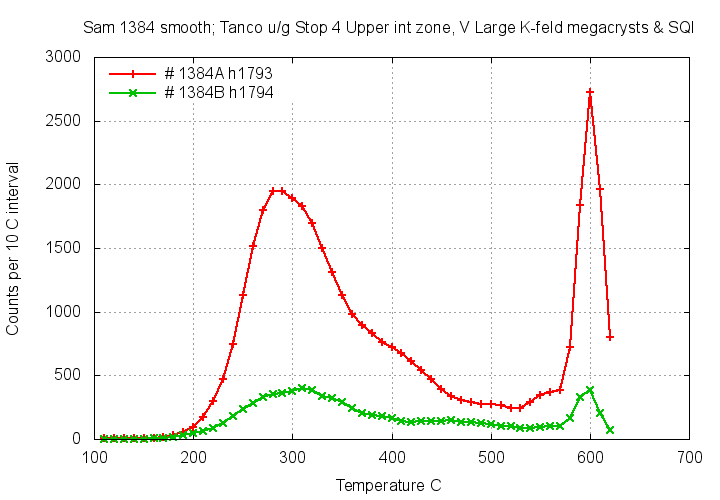 The quartz sample 1381A (red) shows an increased temperature peak at 330 C for the gas peak compared with most other gas-rich samples which show temperature peaks of less than 300 C.
The coexisting feldspar sample 1381B (green) shows no significant decrepitation. It is not clear why coexisting quartz and feldspar contain such different fluid inclusion populations. 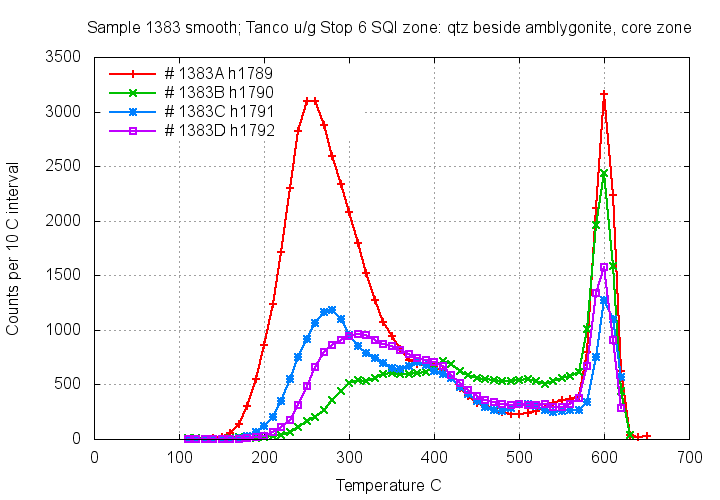 Quartz from the core zone gives the most intense and lowest temperature gas peaks at 280 to 310 C.
Quartz from the core zone again shows intense low temperature decrepitation due to fluids with high gas content. 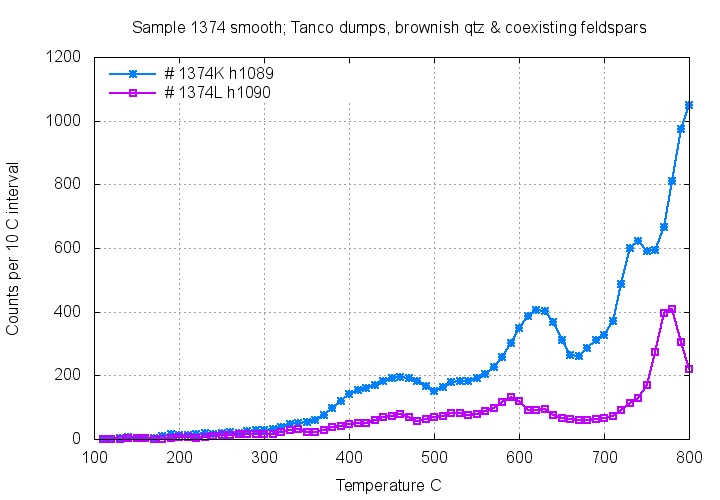 These feldspar samples 1384C and 1384D lack the low temperature gas peak decrepitation seen in the coexisting quartz in the following graph (1384A and 1384B). The two co-located and very similar feldspar samples show remarkably different decrepitation. 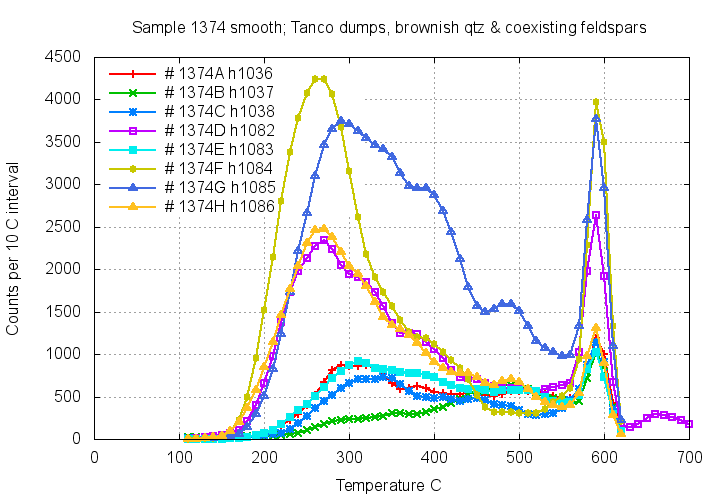 Quartz shows considerable variations between co-located samples, still with significant gas content of the fluids. Pollucite does contain fluid inclusions, but the fluids lack any gas content. Quartz from the high grade pollucite zone has very variable low temperature decrepitation, sometimes with and sometimes without gas rich fluids.